You know that expression “the streets is watching”? Where, if you’re out on the streets, getting into trouble, you gotta be mindful of the fact that someone might have eyes on you? Along these lines, as a parent, good or bad, you quickly learn that you have to be aware at all times. Little kids see and hear everything! It’s like the Sesame Streets is watching. Now, truth be told, pre-kid Mike said and did some stuff back in the day which I’d be embarrassed to do today. At the time, Y.O.L.O. Who cared what people thought of me? Nowadays, though, there are many ramifications for daddy actin’ the fool in public. The most severe one would be that B, J and little KJ could see that behaviour, and emulate it. Other kids might be encouraged to repeat it, as well; kids who, in the heat of the moment, I may not even know are there. This just isn’t cool. Stupidity breeds stupidity, right? As such, the more that we, as responsible adults, can stop being morons acting moronically, the better things will be for the next generation. Not an actual cartographer-quality map. This particular drive-thru is awkwardly designed. 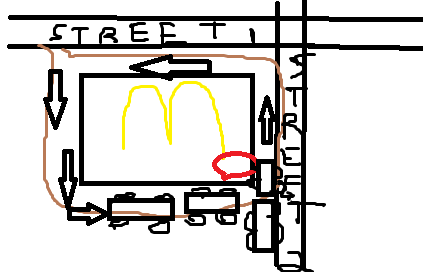 If you enter from street 1, you have to do the full loop around the building when you order. If you enter from street 2, depending on the size of the line, you have to veer off to the side and find a place to wait, before you can get in the line. K was driving home with the kids one evening, when she stopped at this McDonald’s drive-thru. While waiting in line, a dude (late 20ish in age) rolled up in a pickup truck, from street 2. Instead of looping back and going behind K in line, he stopped just off of the entrance. His idea was that after she ordered, she would pull up to the window, and he would slide in line after. The problem with this, though, was that until he ordered, he was blocking the entrance/exit. While K waited, another dude (late 30ish) in a car, with a female passenger, drove up from behind. He wanted to exit onto street 2, but couldn’t, because of the guy in the truck. Instead of politely asking him to move, he proceeded to roll down his window, to hurl profanities. Truck guy wasn’t having any of that noise, so he rolled down his window, and started cussing back at car guy. K was basically trapped in the middle of this swearfest, as she was boxed in, so she locked the doors. Car guy, despite his lady passenger trying to hold him back, did indeed want to go. He hopped out, approached truck guy, and before you could say “let’s get ready to rumble”, they were throwing fisticuffs at each other. K, who was nervous before about the situation, was now scared, so she did what any sensible person would do. Pulled out her phone, shot a video, and sent it to Worldstar Hip Hop? Her and the kids’ safety was more important than going viral. We live in volatile times, to put it mildly. If these two geniuses are the types to start scrapping in a McDonald’s drive-thru over some bad parking, who’s to say that they aren’t the types who have weapons, or even guns, on them, and would start hurting innocent bystanders? As she was talking to the 911 dispatcher, a third dude, who was at the order window, got out of his car. The two brawling mouth-breathers were now rolling around like UFC fighters. This other guy yelled at them to stop…..
Because there were kids watching! 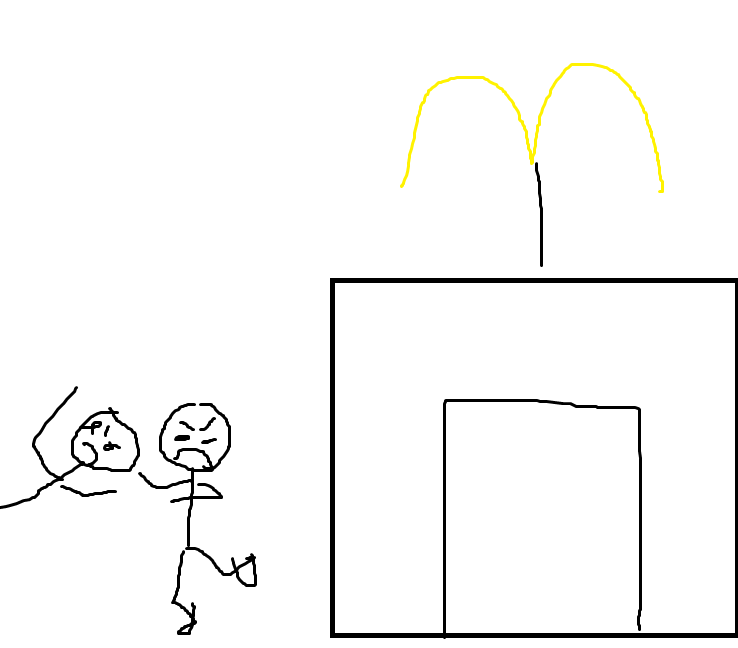 Now, from this incident, do I think my oldest children are going to start swearing and sucker-punching people in fast food restaurants? I mean, they’re pretty impressionable, but hopefully not. Regardless, it really was something that they didn’t have to experience. It’s just another uncomfortable conversation that we, as parents, have to have with them. If you’re like me, you probably have too many of these talks as is. So that’s today’s takeaway, folks. The next time you’re road raging, looking to make a spectacle of yourself to prove a point, or want to get in a fist fight in a McDonald’s drive-thru, think about the kids. The Sesame Streets is watching.